Note: This is out first of many talks outside of the Randall (the Randall is undergoing reconstruction through until the Fall of 2016). Make sure to note the date, time, and location. We won’t likely to be on the third Thursday too often. Keith Hansen is a wildlife artist who specializes in the inspirational and accurate portrayal of birds. His most resent endeavor has been a 14 year project illustrating the book “Birds of the Sierra Nevada: Their Natural History, Status and Distribution”, authored by Ted Beedy and Ed Pandolfino. He illustrated about 1,400 portraits of the 320 species that occur annually somewhere, anywhere, and everywhere in the Sierra. He will be talking about the production of his illustrations and the birds themselves. If you can’t make this talk — his workspace, The Wildlife Gallery” is located in Bolinas California where people can view originals, prints, and the various works that are on display (and the birds visible outside his window!). More about Keith and his work can be found at keithhansen.com. Manage the soil and manage the atmosphere? John Wick came to us on February 19th, 2015 to talk to us about soil. It turns out that our millenias of farming & ranching have left us, overall, with some pretty wretched soil. Soil that is also conspicuously devoid of carbon. John’s route to having a potential fix for capturing carbon back from the atmosphere started in a deceptively simple desire to turn his land back to nature, to re-wild a bit of California. They had 540 acres, three valleys of land. It was not so easy as he had imagined — left to its own devices, the ecosystem fell into chaos and a riot of invasive plants took over. They turned to Dr. John Creque, an scientist and expert in land management, who suggested a controlled application of cattle might help nudge their system back towards native systems. And nudge it did, by 2007 their rented cattle, brought in in April when the swallows came and moved 67 times through 5 weeks, had results. Native perennials began to show up, meadowlarks showed up in great numbers, eagles arrived, and the quail population exploded. Over time, they became interested in whether this was possibly sequestering C02. They turned to another scientist, Dr. Silver who was skeptical, who didn’t think it was likely, and who didn’t think it would be possible to measure, but she was wanted to do the research. Grassland it turns out are big carbon stores, and rangeland now covers more of the earth than forests, so it had potential – if this proved out, there was a lot of possibility to sequester a lot of carbon. And do the Marin Carbon Project was started. They took samples before they began trying to get an idea of what carbon was already there, and then they began with a series of experimental plots both on his land and in the Sierra Nevada. One aspect of this was grazing, another aspect was putting compost down… half an inch. And they began taking weekly readings. And the results were amazing — 30-70% increase in forage compared to control, more water retention in the solid, and an additional ton of carbon per hectare sequestered. Even more interesting was that no additional compost needed to be added (and 96% of the carbon ended up stored), each year and additional ton/hectare was stored, and perennial grasses dominated — and that result happened in both areas. The same experiment was then duplicated on other farms and dairies, with different grazing practices. There still had to be good grazing management, and there had to be compost. Manure and other fertilizers do not work as well, fertilizer is the big can of coke of agriculture, lots of empty calories that don’t do a lot for the system as a whole. 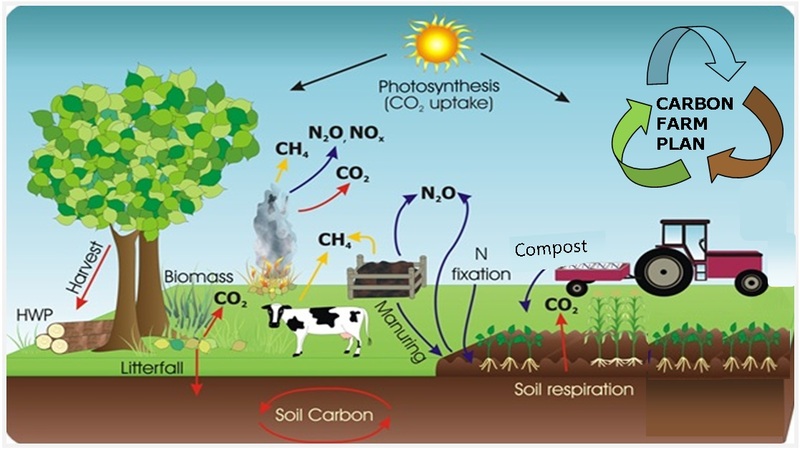 And the most important thing in all of this is the soil, and how the plants interact with it… the plants take in CO2 produce oxygen and, but they also exude sugars — carbon, which get taken up by the microbes in the soil… and this is where the magic of carbon sequestration happens. The two big questions are cost and scale. Additional testing showed that only a quarter inch of compost is really required. Some of the cost is covered by selling carbon credits, and tests are being designed to take it to scale, including a million acre project on BLM land. None of this depends on new technology, just good practices that have been developed with silence. The increased water retention is also a big draw to Western farmers and ranchers who are now deep in drought. But the most important news for our long term future, is that even including the full life-cycle of Carbon costs to this project (transporting cattle, and compost, creating compost, and burping cows), the potential level of carbon sequestration is astounding. They’ve worked out a strong protocol that requires good grazing practices, and not allowing the disturbance on intact systems, no increase in stocking, and no noxious weeds. The project’s focus on rangelands is based on the fact that there are so many, and that with enough land devoted to this practice C02 in the atmosphere could be brought under the 350 mark. So much land has been leached of its carbon by bad grazing practices, 60-70% of solid C02 lost over the last 10,000 years, there is a lot we could do to recover that. They are working on many ways to provide the compost required, composted manure, and chicken manure (compost piles that are hot enough destroy pathogens and deactivate other dangerous chemicals), and the potential to use human waste as compost (using something like Gary Anderson’s fiber chips). The only challenges are perhaps convincing people to use it, and on that front their seems to be great interest from governments around the world (they recently hosted a big delegation from China) and it is the UN Year of Soil. It seems incredible, but this management of soil, this management of the microbes within our soil, could go a long way to bringing our carbon back under the line, and with renewables and efficiency, could do way better.